The Illuminated Backlit Keyboard allows you to work day and night, while easing eyestrain and helping you see the correct keys in any lighting environment. Work at your desk, study, or in the bedroom without disturbing others from dusk til dawn, or anytime inbetween! For business, the small footprint keyboard is perfect in dimly light showrooms, warehouses, or offices. Large 2X bright white letters provide excellent contrast over tradional keyboards that have small white letters on black keys. 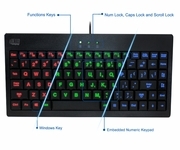 This keyboard is only 11.75" wide and is designed with a Windows Key layout that includes an embedded numeric keypad. This keyboard is a great space saver for your home or office. This keyboard is ideal for use in POS stations, sales, or information kiosks, warehouses, manufacturing environments or anywhere space is limited. 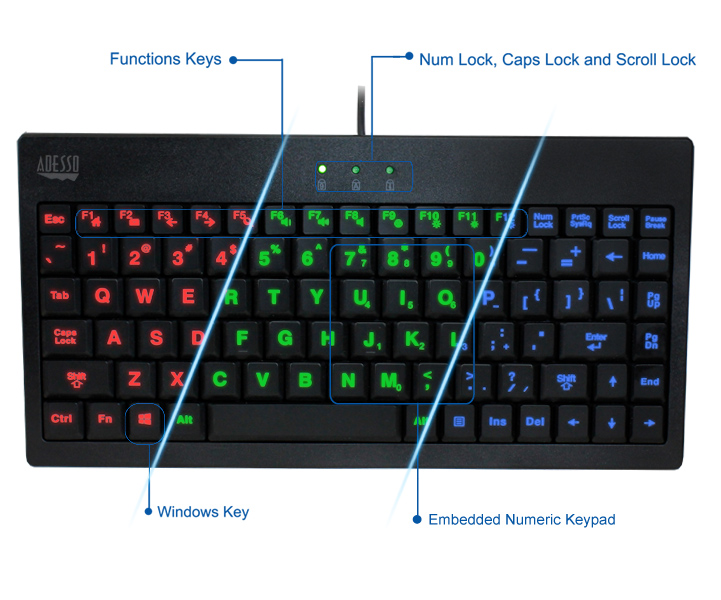 You have Hotkeys to be able to change the LED Color, to Brighten, to Dim, and to turn On/Off your backlit keys, as well as instant access to your commonly used Internet and Multimedia Controls.